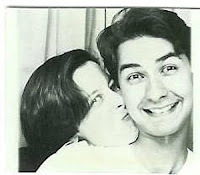 On August 26, 1989, Bub and I got married, after knowing each other for just under two years. We met while working the night shift at Mother's Market in Costa Mesa. The decision to get married was easy; my parents said, "If you're going to get married, do it while we have the money to pay for it." Shortly thereafter, Bub and I looked at each other and said, "Wanna?" "Okay." And here we are today! As you might guess, we are not traditionally romantic, but our romantic gestures have a style all their own. My fifteenth anniversary gift was a tattoo. Here's to many more years of fun and adventure! And not too many more aches and pains. May I offer my sincere congratulations. A successful long-term relationship speaks volumes for both parties. How fortunate you two are. P.S. Side note: Your poll results are looking interesting!